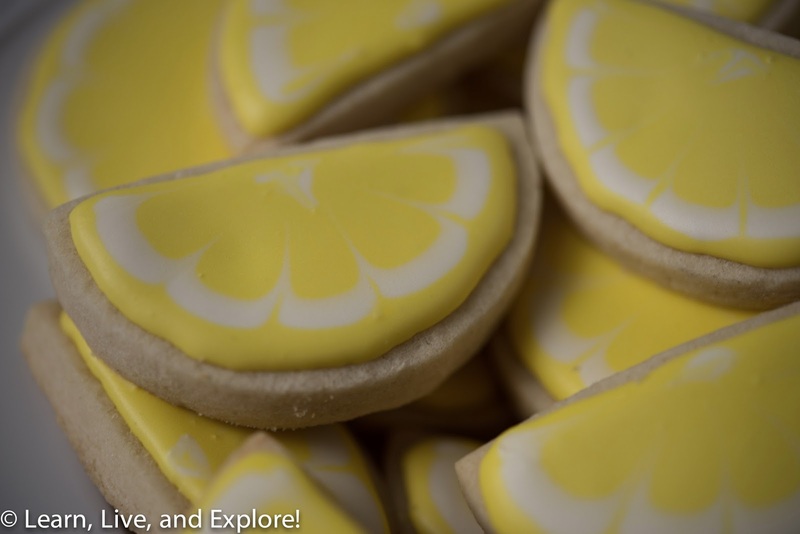 Lemon Slice Cookies....For When Life Gives You Lemons ~ Learn, Live, and Explore! I felt like doing a little cookie decorating this weekend, and I was inspired a photo of some citrus cookies my mom made awhile ago. Keeping it simple, I opted to just stick with lemon slices because it reminds me of summer and a tall glass of lemonade or that garnish on the side of my margarita glass. So with a late May weekend as gloomy, cold, and wet as this one in Washington D.C., it was nice to be creating my own little piece of sunshine in my house. I'm not sure if I've ever posted the two recipes that are staples for any of my cookie decorating, so I'll do it here and forever reference this post in future decorating adventures. Keep reading for a little hint on how to make the white accents on the cookies. 1. In a stand mixer, cream together butter and sugar. 2. Add eggs, one at a time, and vanilla and beat until smooth. 3. Combine dry ingredients in a separate bowl and add a little at a time to the wet mixture, mixing it until everything is incorporated. 4. Divide dough into a softball or handball sized sphere. Place between two pieces of parchment or wax paper and roll it out until it is about 1/8-1/4 inch thick - I prefer thicker. Repeat until all dough is rolled out. 5. Place all rolled dough stacked on a baking sheet. Cover the baking sheet in cling wrap and place in the refrigerator to chill for at least 3 hours. 6. Remove dough from the refrigerator, peel off the paper and cut shapes. Combine and roll out excess dough after cutting to make even more shapes (though it may need to chill for a bit depending on how warm the dough got). 8. Place cut shapes on a silpat or parchment covered baking sheet and bake for 10-12 minutes, ensuring the bottoms don't get too brown. 9. Cool on a rack until completely cool, then frost. 1. Mix together in a stand mixer until powdered/confectioner's sugar is incorporated into the wet ingredients. 2. Beat on high for 7 minutes. 3. Separate into bowls, the quantity depending on what colors you want to use. 4. Add water to the icing in the bowls only one spoonful at a time until you get the consistency you want. 5. Pipe on the cookies as desired. 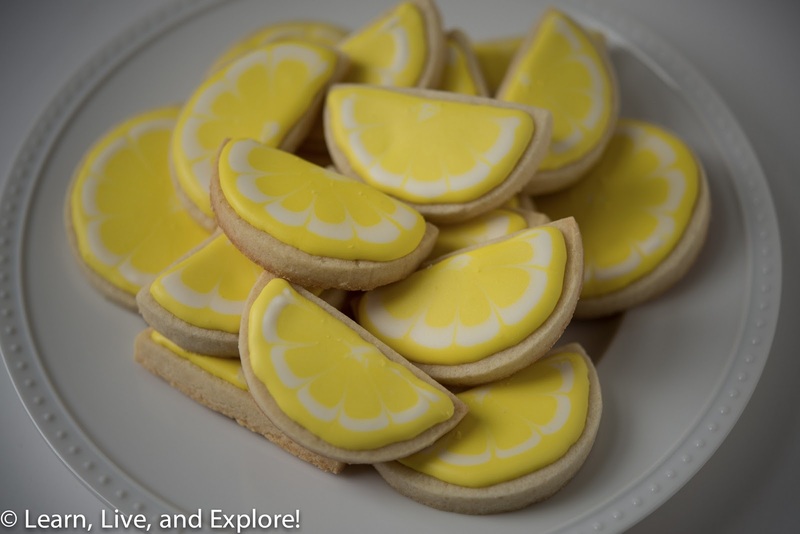 To make the lemon wedges, I used a round cookie cutter and sliced the shape in half. I kept a few whole just for fun. I did not pipe an outline for the yellow, rather kept the icing a little thicker and did the edges and flooding all with one squeeze bottle. Immediately after piping the yellow fill color, I took a squeeze bottle of white icing and did a border just inside the edge and a dot in the center. Using a toothpick, I dragged the outside edge of yellow frosting through the white line and up to the center dot to create the interior triangles. I then spread out the center dot to create a more realistic look. I gently tapped the cookie to make the frosting settled, then used the toothpick to eliminate the air bubbles (not all were successfully popped! ).